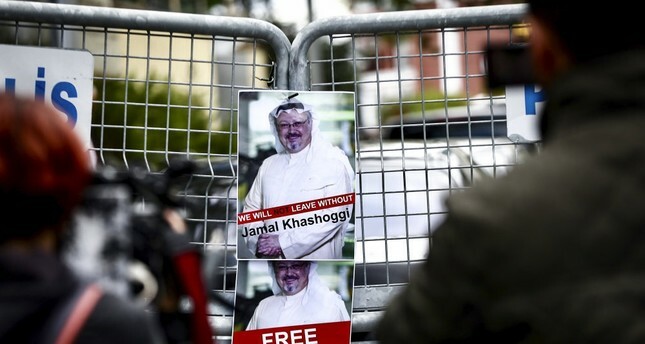 Posters protesting Jamal Khashoggi's disappearance seen on the police barricades around the Saudi Consulate in Istanbul during demonstrations, Oct.14. Questions continue to linger about the fate of slain dissident Saudi journalist Jamal Khashoggi's body at the Saudi Consulate in Istanbul, as the U.S. Under Secretary of State for Political Affairs David Hale stated Thursday that they are taking steps to penalize the culprits of the murder. Speaking at a panel of the Middle East Institute in Washington, Hale reiterated the remarks of U.S. Secretary of State Mike Pompeo and said, "We are taking strong steps, such as revoking the visas of Saudi officials and considering examining the applicability of the global Magnitsky sanctions [which targets people responsible for human rights violations or corruption]." Pointing out that the U.S. is very concerned about the issue, Hale called for Saudi Arabia to reveal the truth about the case and find those responsible. He added, "Until now some steps have been taken, yet more should be done." Hale also underscored that they believe it is possible to maintain strategic cooperation between the two countries while the culprits are being penalized. Khashoggi, a Saudi national, disappeared on Oct. 2 after entering the Saudi Consulate in Istanbul to receive paperwork related to marriage. Later, Istanbul's chief prosecutor's office revealed that once inside, Khashoggi was immediately strangled and then dismembered presumably by the 15-member Saudi assassination team that arrived in Istanbul and visited the consulate when the journalist was inside. All of these individuals have since left Turkey and were later arrested by Saudi authorities. Previously, the U.S. revoked the visas of the individuals responsible for killing the journalist, and President Donald Trump indicated that Riyadh was trying to cover-up the matter and that Saudi Crown Prince Mohammed bin Salman (MBS) may have been involved in the case. However, U.S. President Donald Trump appears reluctant to impose further sanctions as he sees Riyadh as an important ally to contain Iranian power in the region. U.S. lawmakers, on the other hand, aim to suspend negotiations with Saudi Arabia for a nuclear technology sharing agreement and have called for halting the arms sale to Riyadh. Trump maintains that an order of $110 billion in weapons that support 500,000 U.S. jobs should not be put in peril, and he will leave the consequences for Saudi Arabia up to Congress, who will consult with him. Accordingly, Trump announced on Wednesday that he was consulting Congress on how to respond to the murder and that he would have "a very strong opinion" to offer next week on the killing. Riyadh has changed its official position on what happened to the journalist on multiple occasions, fueling the suspicions of Saudi high-ranking officials' involvement in the killing. Initially denying and later playing down the incident as an accidental death during a fistfight, almost three weeks after the disappearance, Riyadh finally admitted that Khashoggi was murdered in a premeditated incident. Subsequently, the country initiated a joint investigation into the matter, sending Saudi Attorney General Sheikh Saud al-Mujeb to Istanbul as a part of the investigation. Hatice Cengiz, the fiancee of Khashoggi, said she is horrified by the details of the journalist's murder, following recent Qatar-based Al-Jazeera reports that suggested the body was dissolved in acid. "I'm unable to express my sorrow to learn about dissolving your body Jamal! Are these killers and those behind it human beings?" Cengiz shared on her official Twitter account. Cengiz added that she and Khashoggi's family were deprived of conducting funeral prayers and burying him in Medina as they had wished. Despite the comprehensive investigation, the body of the journalist and the local collaborator believed to have been responsible for dumping the body have yet to be found as Saudi authorities refuse to make an official statement on the issue. Meanwhile, the killing has drawn unprecedented international outrage against Saudi Arabia, as many world leaders blamed MBS for the killing of Khashoggi, an outspoken critic of the prince. President Recep Tayyip Erdoğan also underscored last week that Khashoggi's murder was ordered from the highest levels of the Saudi government. Most recently, Boris Johnson, a former foreign secretary of the United Kingdom, said yesterday that "Nor do I doubt for a second that this disgusting assassination was ordered at the highest levels of the Saudi regime." Johnson also expressed his fear that culprits may brush the matter under the carpet and get away with their actions due to their enormous power.